Why should my child have a Rockmount school lunch? Pabulum provide all of our school lunches. They have a reputation for excellent service and fabulous food. They ensure that only the freshest, finest, honestly sourced ingredients are used in their meals. The food is not only delicious but very healthy too! Natural, home grown, organic produce is used wherever possible and every effort is made to ensure that producers have received a fair price for their goods. They skilfully steam and simmer and sizzle, so even the particularly picky enjoy some goodness at mealtimes. Every yummy mouthful served has been lovingly looked at, to make sure it goes above and beyond the Government's guidelines for nutritional standards, whilst tasting delicious. Pabulum only work with suppliers whose guidelines on growing meet our high standards. 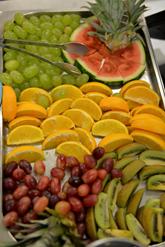 Reception and KS1 children are entitled for free school meals. Our school meals are very reasonably priced at £2.20 each, £11.00 per week. 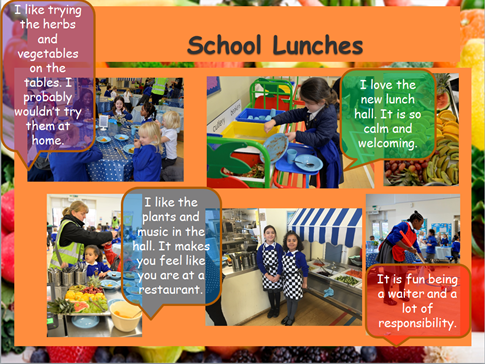 In response to pupil voice, we continuously work on improving the dining experience. Recently our school council met with our new chef to discuss future plans and to provide feedback about the meal choices, following a pupil survey. We feel the new tablecloths, plants, soft background music and conversation cards are fantastic. To continue to encourage the development of social skills the school council and lunchtime monitors developed new child friendly conversation cards. During lunchtime children can access the cards on their tables to prompt their discussions about topics such as healthy eating, holidays and hobbies. The cards have been a great success and we love how creative the children have been. We are very excited about the new topics for conversation! The school council also met with our catering company Pabulum, to discuss ideas to develop school lunch choices as a result of pupil surveys. The meeting was highly successful and as a result our home grown vegetables have been enthusiastically harvested, cooked and eaten by our pupils. The cooks now liaise regularly with staff and pupils and are very much part of our whole school community. Children signed up to volunteer as lunchtime waiters. All waiters have received initial training and await further training from Croydon College. Pupil feedback shows a positive attitude towards the waiters and the role has supported the development of the lunchtime experience.